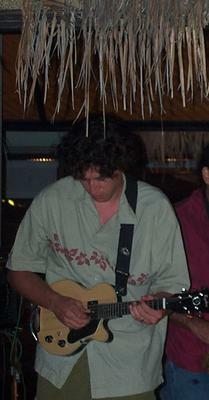 plays in a California band called Kulica. He writes: " I am currently playing a custom Steve Ryder EM-35 5-string which I love. I discovered Steve Ryder via the EMRP! Keep up the great work! "I first learned about the electric mando by seeing Matt Mundy play with Col. Bruce and the ARU in the early to mid-1990s. I made my first electric mando in 1998 out of an old mini-Strat kit after being inspired by Jethro Burns and Sam Bush. Soon after, I got a Korean-made Fender 5-string (which I sold a little while ago.) Having opened for Merle Haggard a couple times, I learned more about Tiny Moore and his 5-string. I had a Sherwood just for our first tour to Hawaii 2 years ago. After getting back home from Hawaii, I ordered my EM-35 from Steve Ryder. My style blends the picking of Jethro Burns with the feeling of Carlos Santana."